I think everyone should get a flu shot, and if you haven’t had one yet now is the time. The more people are vaccinated, the fewer chances everybody has of contracting the flu and passing it along to somebody who has a compromised immune system. If you know and love a young adult cancer patient, get a flu shot. If you don’t know one of us, do it for your elderly grandma, your infant nephew, or just because you care about the well being of a stranger. Flu shots are not just about protecting yourself, they are about helping to protect your community. Lots of myths about flu shots prevent people from getting them. Educate yourself so you can make informed decisions about whether or not to get a flu shot. Here are some authoritative, reliable resources for learning more about flu shots. This CDC article answers questions about whether the flu shot can actually give you the flu, tells more about nasal spray flu vaccines, answers how often you need a flu shot, and much more. Did you know that if you have had cancer you are at higher risk for contracting the flu? Learn more about this and other cancer and flu specific FAQs on this CDC page. Also see the American Cancer Society’s flu shot recommendations for cancer patients and survivors here. I was thrilled to learn this is the first year a flu shot is being offered that protects against four strains of the flu instead of just three. I went out of my way to get a quadrivalent shot because cancer has made me never want to be sick again! Learn more from the CDC about the quadrivalent flu vaccine. How can I get a free or reduced cost flu shot? If you have insurance you are in luck because The Affordable Care Act requires most private insurers to cover your flu shot for free. But what if you don’t have insurance? Your best bet is to call a low-cost health clinic near you and ask if they offer flu shots for free or on a sliding scale. If they don’t, they can usually point you to another place that does. The link above will help you find clinics in your area that receive federal funding, and you can also use this site to find contact info for your state’s department of public health. 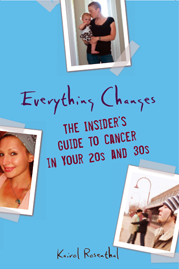 For more practical tips on how to make smart healthcare choices, check out my book Everything Changes: The Insider’s Guide to Cancer in Your 20s and 30s.